The two surviving members of the Fab Four joined a host of celebrities including Madonna for the premiere of a new documentary charting their live gigs and meteoric rise to fame in the 1960s. Sir Paul McCartney said looking back at footage from the Beatles’ touring years when the band took the world by storm was “emotional and very special”. John Lennon’s widow Yoko Ono, and Olivia Harrison, widow of George, also attended the screening in London, which followed the world premiere in the Beatles’ home city of Liverpool earlier on Thursday. 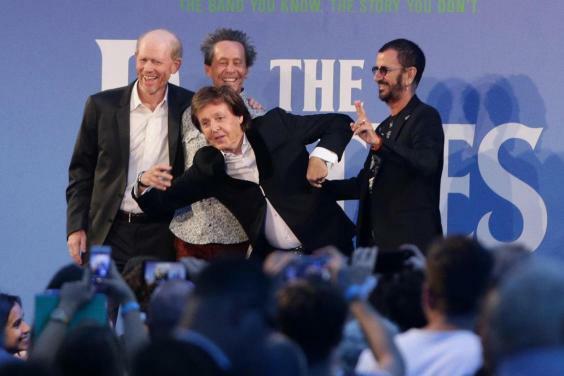 The film, directed by Oscar-winner Ron Howard, features remastered footage of the band’s sell-out stadium concerts in America, which followed their early days playing in The Cavern Club. Speaking on the blue carpet, Sir Paul told reporters: “We’re getting great memories obviously of playing with John and George. The band played their last big concert at Candlestick Park in San Francisco in 1966, and had their last live performance together three years later on the rooftop of their Apple Records headquarters in London. Mrs Harrison paid tribute to Howard’s work on the film, describing him as “a great storyteller”. She said it was “sweet” that some of the home movie footage is from her husband’s 8mm camera.